Virtualenv tutorial. In this tutorial I will show you in easy steps how to install and use VirtualEnv & VirtualEnvWrapper on your CentOS 6.x environment. METHOD B: You also can install PIP using yum but it’s not recommended. Reload your startup file (e.g. source .zshrc) and you’re ready to go. VirtualEnv Tutorial can only start with installation…. the above command will create a new ‘myenv’ directory and will install easy_install and pip to that directory. you can see now the command display your virtualenv name in left of the bash shell inside brackets (myenv). 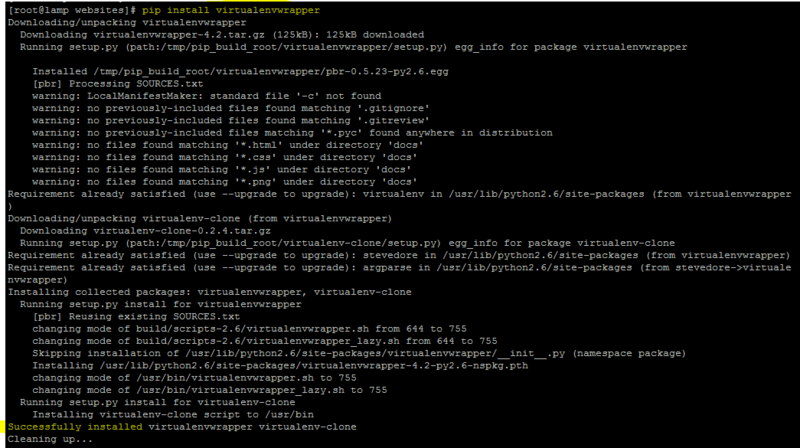 You can see inside the myenv/lib/python2.6/site-packages you will find the django framework egg. You can create a requirement file which will help you download & install all the necessary libraries when you deploy or git clone your application elsewhere later. -l = If in a virtualenv that has global access, do not output globally-installed packages. notice that you are not connected to (myenv) anymore. we’ve finished with the virtualenv tutorial basics. so,… you want more? The default for WORKON_HOME is “.virtualenvs”. if you missing this line it will be set auto to default when running virtualenvwrapper.sh. I’ve changed it so you could see how it impacts. The third command creates new files inside your new ~/Envs (WORKON_HOME) folder. …and that’s it! Now you’re all set to start using virtual environments! Note: as in Virtualenv. you can see that after the mkvirtualenv command you’ve entered the virtualenv automatically (myenv). you don’t need to cd into the folder and use the ./bin/activate command anymore. It’s working wherever you are on your filesystem. The workon command also includes tab completion for the environment names. command to install all the packages here. If you connected to this virtualenv you must deactivate first. When you type the workon command it invokes customization scripts as an environment is activated or deactivated (see Per-User Customization). or why not install something for us when we create a new virtual environment? This is great feature! you don’t need to see the virtualenv folders at your project folder and you can save your requirment.txt file at the project. read this great script which helps you activate your virtualenv whenever you enter your git folder. For starter – you can find here a full python .gitignore for your new project. This entry was posted in Centos, Linux/Unix, Python and tagged CentOS, CentOS 6.x, Python on January 21, 2013 by Etay Cohen-Solal. Don’t forget to unalias pip when you want to use another environment.